This is the front of the Taft Middle School in Brighton, one of Boston's neighborhoods. The school is named after William Howard Taft the 27th President of the United States (1909-1913) and later the tenth Chief Justice of the United States (1921-1930). He is the only person to have served in both offices. Checking Wikipedia I discovered that Brighton is named after the town of Brighton in the English city of Brighton and Hove. For its first 160 years Brighton was part of Cambridge and was known as “Little Cambridge." Throughout much of its early history it was a rural town with a significant commercial center at its east end. Brighton separated from Cambridge in 1807 after a bridge dispute and was later annexed to Boston, in 1874. Some notable residents of Brighton were Michael Bloomberg, current mayor of New York; John Krasinski, star of the U.S. version of The Office; and Dennis Lehane, author of Mystic River and many other Boston based novels. 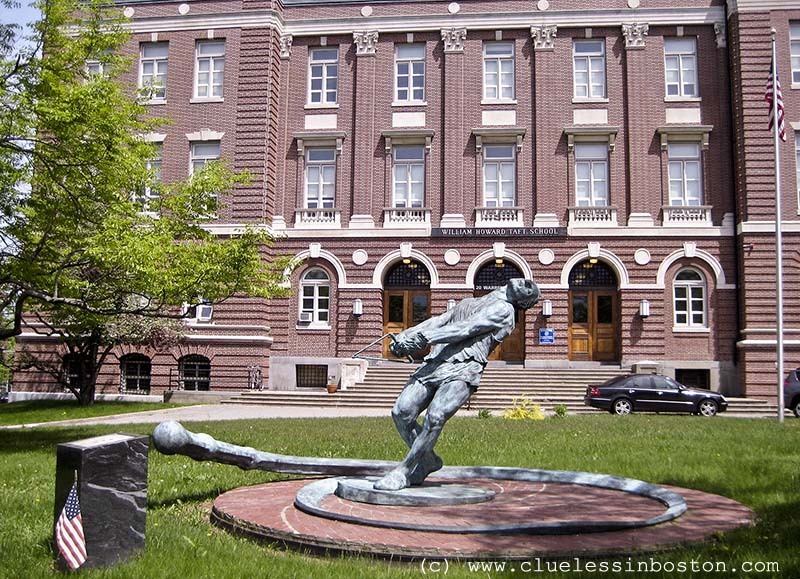 Thanks to Jack in Hartford for finding some information on the sculpture in front of the school. It is Harold Connolly, a four time Olympian who set many national and world records in the Hammer throw. Connolly went to this school when it was Brighton High School, which is now located across the street. Read more about Harold Connolly. I've read all Dennis Lehanne's books published in France! i like his books so much! I'm glad to see a place where he was. The statue is absolutely fabulous! Love the shot! and thank you for all that info. Lehane is a good writer. I haven't seen the American version of the office. Thanks for the info about the artwork Jack! Thanks Clueless in Boston, obviously not clueless at all. Did I mention that out of the different American accents, Boston is my fav. Ya, what's the deal with the art? Significant there? Beautiful, classic school. I hope the inside is kept up as well as the outside. Very curious piece of art so prominently displayed in the school yard. Wonderful post with information supplied by Jack... That is a wonderful sculpture! Gosh, what grand old buildings you have for schools!! We certainly don't have such gorgeous architecture in our school in England. They are modern glass and concrete monstrosities! Interesting history and love that statue, you can feel the action of Harold's strength.